Jenny manages the day to day menagerie of field work, harvests, marketing, and finance. When she met Liam, she was working at Essex Farm where she managed the dairy and vegetable departments. Her love of rural farming and fruit came during a year-long internship at Full Belly Farm in northern California. She has previously studied and worked in the field of urban design, site planning, and community development. Liam is both the muscle and the brains behind the operation, serving as our carpenter, tractor operator, woodsman, and mechanic. He also generally manages the livestock. He is currently studying Agriculture Science at Cornell University with a focus in Vegetable and Fruit Crops. His off farm pursuits include rock climbing, playing soccer, back country skiing, and the cello. Mike started farming Harvest Hill Farm 20 years ago with Laurie and their three young boys. He has directed Cornell's Willsboro Research Farm and Chazy Farm for almost two decades, conducting research into season extension, organic grain, and biofuel production. 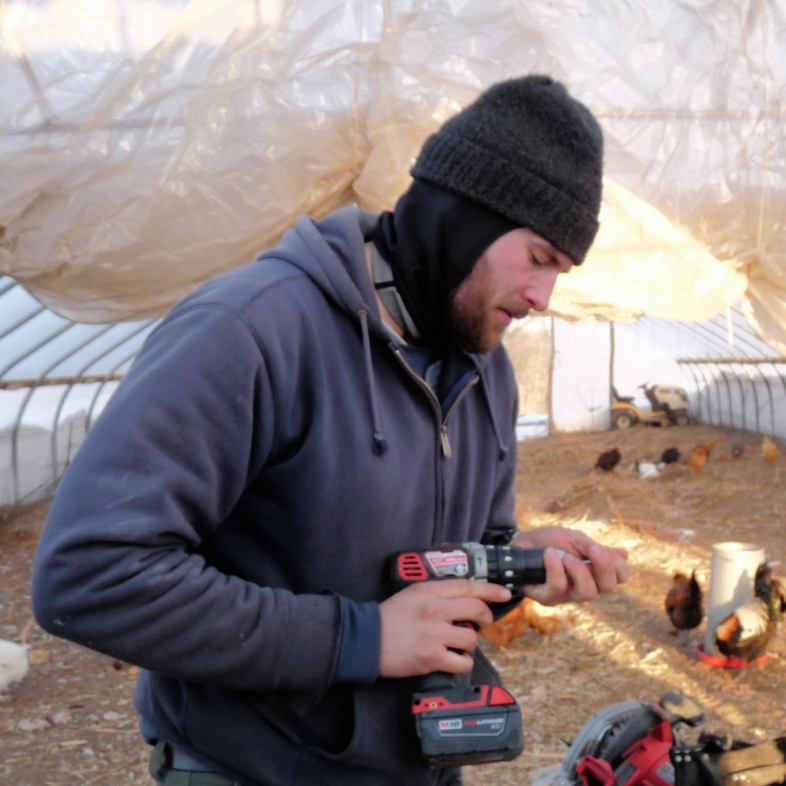 Mike has been thinking about, researching, and developing ideas in small farm sustainability and alternative systems for years. Aside from directing the garlic seed enterprise with his father, he regularly does the farm chores, keeping the creatures alive and happy, and provides ample physical and moral support on large projects and harvests. He is an avid runner, outdoor enthusiast, and our resident bee whisperer. Laurie works for Cornell Cooperative Extension of Essex County and spent years as the acting director of Adirondack Harvest, an organization supporting local farmers and connecting them to their community and regional markets. On the farm, she lovingly crafts our soaps, serves as our financial and organizational guru, cares for the winged creatures and is our acting flower goddess and bee aficionado. She is also top notch at fine motor skills, which makes her immaculate at knitting, hand weeding, and microscope dissection. Aiden, pictured with Laurie, is our big-hearted, rough 'em tough 'em farm dog. Ryan joins us part time in the summer, lending a hand for harvest and cultivations, going to market, and making deliveries. Ryan is pursuing a degree in Exercise Science from SUNY Cortland. His special interests include playing soccer, dominating on the volleyball court, and making smoothies.